Lemons are normally a staple in my kitchen. I use lemon juice to make salad dressing and add zing to soup, and lemon zest to cut sweetness in cakes, glazes, even cookies. In the past, I purchased a tidy bag of lemons at Trader Joe’s every week, but here in Morocco, this ubiquitous citrus fruit is not always so abundant. At the peak of summer for example, the marketplace is bursting with figs and peaches, but lemons are harder to come by, given that fruits and vegetables are actually available according to season. Because it’s February, I feel I’ve got to take advantage of the bounty of winter citrus in the souk. Last year, some French friends of my roommate gave us a jar of homemade lemon curd, and I thought how French, to casually whip up some creme au citron to spread on your morning baguette. It turned out to be exceptionally delicious, spread on toast, mixed into coconut yogurt, eaten with a spoon out of the jar. And with a little research, I realized that it is also simple to make. 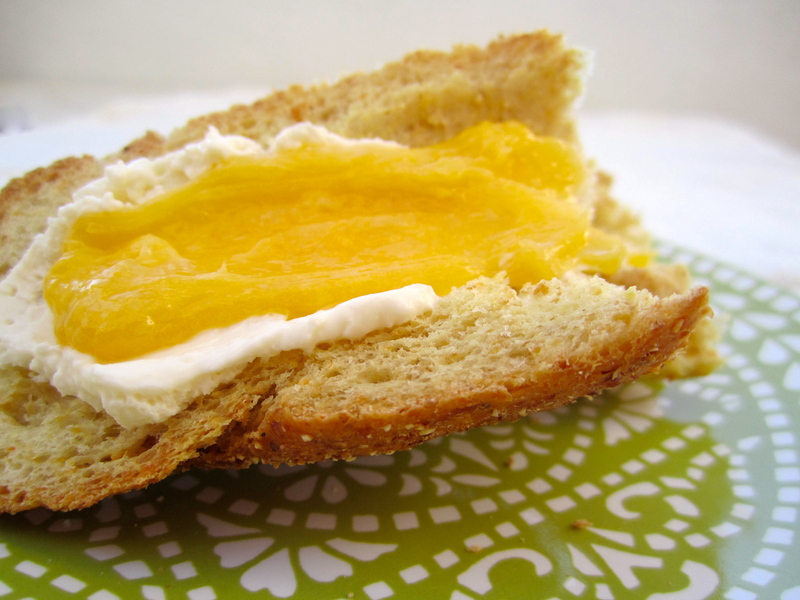 I made lemon curd yesterday morning to eat with fresh cheese and bread, a perfect accompaniment to my Saturday brunch. Bon appetit. *note: I felt I could trust Martha (Stewart), so I used her recipe. It makes quite a small amount (about a cup), so you might want to double it for a family. 1. Combine all ingredients in small saucepan and whisk to combine. Set over medium heat and stir constantly with a wooden spoon until the mixture coats the back of the spoon ( 5-6 minutes). 2. Take off the heat, continuing to stir, and whisk in the butter 1 tablespoon at a time until smooth. Scoop into a small bowl and place plastic wrap (or a clear plastic bag) over the surface to prevent a skin from forming. Leave in the refrigerator for 1 hour (or 45 minutes, if you’re as impatient as I am). Can be refrigerated for 2-3 days. * I have found the easiest way to separate the yolk from the egg is to crack the egg in two and pour the yolk back and forth between the halves over a bowl until the white has drizzled out. Use leftover whites for an especially healthy omelette, or an especially delicious batch of meringues. This entry was posted in Sweet and tagged lemon. Bookmark the permalink. I LOVE home made lemon curd. LOVE. Place the egg in a hot skillet, then turn the heat waaay down. Simmer the egg super slow, then add lowery’s seasoning spice as recommended by Joe Palakis. Voila, yellow and white object on toast for breakfast.